Frequent wildfires on the Gifford Pinchot National Forest (GPNF) in recent years warrant a response concerning the factors influencing wildfire occurrence, federal agency response, and post-fire salvage logging. While this paper references various documents, its purpose is to provide the Cascade Forest Conservancy’s position on wildfire management and does not purport to be a scientific or research-oriented report. The goal is to summarize actions that can be taken to prevent undue ecological harm and avoid unnecessary financial expenditures. The terms wildfire and fire are used interchangeably and refer to fire on wildlands and not structural fires. The content concerning fire resilience is more relevant for eastside forests, which are drier and experience more frequent fire intervals. U.S. Forest Service policy on wildfire suppression grew out of the 1910 Idaho and Montana “Great Burn” conflagrations and other early 1900s’ large wildfires in western states, such as the 1902 Yacolt Burn that covered an estimated 500,000 acres in and around the GPNF. Public outcry and congressional pressure pushed the agency to develop policy and resources to put out all fires on national forest lands. Fires were viewed as the enemy and a military-like organization was created to deal with the “threat.” In spite of being a multiple-use resource management agency, the highest priority was putting out fire. The Forest Service adopted a “10 o’clock” rule mandating that all fires be put out by 10:00am the day after discovery. In that era, fire was not seen as having any benefits and, rather, viewed as a destructive force. However, in the late 1990s, scientists realized the agency’s historic philosophy was not working. Fires were getting more frequent and larger, e.g., the 1988 Yellowstone Fire. Forest management during the 1950s to 1980s exacerbated the problem. Timber harvesting emphasis on the GPNF and other national forests during that era removed most of the large, old growth trees. These large and mature trees, particularly ponderosa pine and Douglas-fir, have thick bark making them resistant to fire. Eliminating the most fire-resistant trees was given little thought in national forest timber management plans. The goal at that time was to maximize timber harvests for the housing market and create a vigorous young forest. It wasn’t until legal action protecting the northern spotted owl in the 1990s that the Forest Service changed direction to protect old growth through the Northwest Forest Plan. Almost a hundred years of fire suppression have left many areas in the western national forests, including many parts of the GPNF, in a state of high fuel loads with dense vegetative overcrowding and stressing trees, often under attack by insects and disease. Further, as a result of climate change, scientists are predicting increased drought and more frequent and larger fires. Stand replacing fires on the GPNF have a pattern of occurring every 200+ years in moist, west-side forests and every 25-75 years in dry, eastside forests. Historical fires on the GPNF have created a diverse pattern of burn severity, with large areas rated as low severity. However, many recent fires contain large areas rated as mixed and high-severity with stand-replacing conditions. Further, several fires in the Mt. Adams area have re-burned areas two to three times in the last eight years. The 2015 Cougar Creek Fire re-burned 4,776 acres of the 2008 Cold Springs Fire and into the eastern edge of the 2012 Cascade Creek Fire. Firefighting now takes up 52% of the Forest Service budget nationally. Funds intended for natural resource management, including thinning, are diverted to firefighting. The funding situation has gotten high political visibility. The Forest Service created a 2015 report highlighting the issue and recommending Congress fund firefighting differently. While not the primary subject of this report, much of the controversy of wildfires deals with people building homes in high fire-risk areas in the Wildland Urban Interface (WUI). Destroyed homes and lost lives get media and political attention. The 2015 Cougar Creek Fire potentially threatened homes and towns near Glenwood. The outer edges of the GPNF do have adjacent subdivisions in some areas; the town of Packwood is close to the Forest’s perimeter. However, most GPNF fires primarily affect national forest and adjacent public or private forest land. Some recent fires, like the 2008 Cold Springs and 2012 Cascade Creek fires that started in the GPNF, either threatened or burned Yakama Nation timber and recreation resources. In the past, clearcutting was a common practice in the GPNF. Not only did this practice highly impact soils, watersheds, and wildlife, but the trees that were planted in replacement have also impacted the forest’s resilience. These trees, all planted at the same time, grew into monoculture stands of same aged trees that we call plantations. These plantations often become dense stands of young trees, which not only lack diversity on many levels, but leave the forest more susceptible to pest outbreaks and fire. This is especially true to the drier forests that we have on the east side of GPNF near Mount Adams. One solution is to carefully thin these plantations to allow for increased diversity within the stand and increased fire resiliency. In the mixed conifer forests on the east side of the GPNF, including the Upper White River Planning Area, fire suppression has also resulted in a shade tolerant conifer species, grand fir, growing at high densities and out-competing Douglas-fir and ponderosa pine species. Relative to Douglas-fir and pines, grand fir is less fire tolerant because it has thinner bark. It is also more susceptible to spruce budworm and fir engraver beetles, resulting in a relatively high mortality rate. With the encroachment of grand fir, in conjunction with the potentially increased fire severity scenario and drought conditions introduced through climate change, older ponderosa pine and Douglas-fir trees are at risk. These normally resilient old growth species are now more susceptible to stand-replacing fires due to the grand fir trees acting as ladder fuels and carrying the fire into the crowns of the large trees. Susan S. Hummel, research forester with the Forest Service, has reported that conditions in the Upper White Salmon (Gotchen) area are rated high for the threat of stand replacement fires. She recommends tree thinning in the 7”-16” grand fir component and states that this could reduce threats of high severity fires and maintain older forest structure. The large areas of the forest dominated by grand fir have little tree species diversity, which is unhealthy from both a fire resilience and an ecological diversity standpoint. The Forest Service has various proposals to thin grand fir stands and, if needed, plant other species such as ponderosa pine, Douglas-fir, and western larch. A conflict can occur when stands with large grand fir provide spotted owl habitat, especially in Late Successional Reserve areas. However, as long as important habitat is protected, including northern spotted owl critical habitat, the Cascade Forest Conservancy is generally supportive of this type of thinning. Thinning in these areas, while likely beneficial from a fire-resilience perspective, brings possible risks of its own and should be carried out with great care and only with specifically tailored and monitored treatment prescriptions. Involving stakeholders in this process can increase valuable community participation and understanding. Prescribed fire, also called underburning, can be used as a method to increase fire resiliency and is primarily appropriate in dry east-side forests. Prior to prescribed fire usage, fuel loading must be reduced to ensure the prescribed fire does not get into tree crowns and escape the planned burn area. The Cascade Forest Conservancy is supportive of a two-step process of thinning to reduce fuel loading and then using prescribed fire to increase the forest’s resiliency to wildfire, with the above-mentioned caveats regarding habitat protections. Increasing resiliency through the use of prescribed fire should lead to the situation where we can allow natural fires to burn more freely. From a fire-resilience perspective, it is critical that these steps are repeated every three to five years until old growth conditions shift back into a self-maintaining state. Otherwise, regrowth of shrubs and grasses can nullify the value offered by the process. The Forest Service now realizes the problems that the era of fire suppression created, as well as the role of fire in creating a healthy forest ecosystem. However, in the throes of a wildfire, the on-the-ground reaction and first tactic is to suppress the fire. While recognizing the science on the one hand, the Forest Service has not really changed its firefighting approach. Under predetermined conditions and fuel loading, wildfire could be managed similarly to prescribed fire. To better balance ecological and economic needs, the Forest Service focus needs to change from fire suppression to fire adaptation. While some fires have been human caused, many of the recent fires have been ignited by lightning. The Interagency 2003 Wildland Fire Management Strategy directs that consideration will be given to allow naturally ignited wildland fire to burn to serve its ecological role for natural resource benefits. The strategy framework also directs each national forest to have a Fire Management Plan, identifying where and under what conditions a wildfire will be allowed to burn. Unfortunately, the GPNF Fire Management Plan is not officially approved. The presently unapproved plan states the Forest Service should “support an ecological approach to resource management” and that fires “are managed using the full range of wildland and prescribed fire options.” The unsigned Plan has a matrix to allow managers to use the “confine” strategy in Wilderness. We believe “confine” should also be an option in Late Successional Reserve and Matrix lands. It is time for GPNF leadership to create fire management policies that are in sync with wildfire and ecological science. The GPNF Fire Management Plan needs to be revised and approved to allow natural fires to burn unsuppressed under defined conditions and in defined areas. Fires are a natural force of nature and essential for creating a healthy forest ecosystem. Fires enhance biological diversity. Many wildlife species, such as the black-backed woodpecker, are dependent on burned forest as habitat. There is a large amount of research, including a significant number of studies from Forest Service scientists, recognizing the value of fire to the forest ecosystem. Fire kills insect or diseased weakened trees and starts a new forest. Fires provide carbon and other nutrients to soil. Suppressing fire foregoes the benefits that fire can provide. Suppressing fires creates ecological impacts on the land. Firelines, especially those created by bulldozers, compact and displace soil, creating erosion and detrimental watershed impacts. Burnout operations can create unnecessarily large areas of high severity fire, negatively impacting vegetation, wildlife, and soil and watershed health. Suppression also creates conditions that lead to high-intensity fires that are especially damaging to soils and watersheds. Fighting fires is very expensive. The relatively small Mt. Adams Complex Fire (405 acres) cost $5.2 million. The nation and the Forest Service simply cannot afford to put out all fires when there is an alternative to let some fires burn. The GPNF could serve as a leader in shifting agency practices. Firefighters’ lives are put in danger. Every year, firefighters’ lives are lost. Yes, many of these deaths occur while protecting homes and structures, but lives are also lost fighting wildland fires. It is difficult to predict how many lives would be saved by letting some wildland fires burn. While we’d like the Forest Service to change its fire suppression practices on all national forest lands, a place to start changing suppression practices is in Wilderness. Wilderness areas are to be managed under the philosophy that natural ecological processes are the dominant force of change and stability on those lands. The Forest Service’s Wilderness Pocket Guide document states, “[n]ow managers are working to introduce fire back to Wilderness to correct the damage that exclusion has caused.” We encourage these actions and would like to see more of this in Wilderness areas within the GPNF. There is precedence for not suppressing fire in Wilderness – portions of the 2012 Cascade Creek Fire were allowed to burn into the low-fuel areas of the Mt. Adams Wilderness. We recommend that, unless fire risk conditions such as fuel loading, staffing and weather would likely lead to a dangerous fire situation outside of Wilderness boundaries, naturally ignited (e.g. lightning) fires in Wilderness be allowed to burn. A strategy of monitoring the fire through use of a “confine” strategy should be used. The Friends of Mount Adams reviewed the Mt. Adams Complex/Horseshoe Fire and has created a comprehensive report, which was sent to the Forest Service. That review provides an analysis and associated recommendations to allow wildfires to burn in Wilderness. We agree with and support those recommendations. 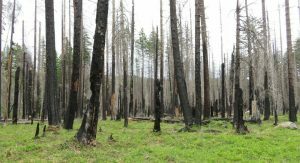 After a fire has swept through a forest on public land, there is often a discussion about salvage logging. Post-fire salvage logging is the removal of trees—sometimes both live and dead depending on the prescription—from a forested area after a wildfire disturbance. Due to overwhelming evidence that salvage logging is detrimental to wildlife, aquatic systems, and the regrowth of trees and shrubs, the Cascade Forest Conservancy opposes this practice. Even partial salvage logging has been shown to have a substantial degree of negative impact on the ecosystem due to the sensitive components of a post-fire landscape and the fact that the drivers of salvage logging are largely economical. Salvage logging negatively affects important post-fire habitat for cavity nesting species such as the black-backed woodpecker. These practices can also increase sedimentation to streams, which negatively affects fish species and aquatic systems. Further, regrowth of trees and understory vegetation can be hampered by salvage logging due to impacts from heavy equipment and disturbances to soil and seeds. We recognize that there are measures that can be implemented to lessen the negative effects of post-fire logging, such as carrying out the treatment over snow, and avoiding steep slopes and riparian areas, and creating a bed of branches and cull tops for equipment to run on. The Cascade Forest Conservancy would only support a salvage logging proposal if the ecological benefits from the project outweighed the negative impacts. At the present time, we have not seen salvage proposals that meet this standard. Planting and seeding in forests that do not have an existent seed source for the proper reestablishment of a healthy ecosystem represents a beneficial post-fire management response. This would be appropriate, for instance, in areas that were negatively altered by a history of grazing, fire suppression, or inappropriate forest management. Reestablishing resilient ecosystems is very important in the mixed conifer forests near Mount Adams, as well as in plantations in other areas of the GPNF. Identifying opportunities to promote this resilience and improve ecosystem health is critical to our work protecting the forests and wildlife of the southern Washington Cascades. Protect the largest, most fire-resistant trees, especially Douglas-fir and ponderosa pine by removing immediately adjacent and competing trees, especially grand fir. Focus post-fire management on the planting and seeding of native species, where appropriate, and only pursue salvage operations where science has shown the ecological benefits of the action outweigh the negative effects to the environment.